Assistant Professor Ryuji Okazaki and his coworkers at the Graduate School of Science, Nagoya University, discovered that two different electronic phases (i.e., the conductive and insulating phases) may coexist over a wide range of temperatures in an organic material. Their paper was published in Physical Review Letters on November 22, 2013. Just like materials change their form depending on the ambient temperature, electrons also change their phase according to the temperature. Water changes its form from liquid to solid when it is cooled down to 0°C, and water and ice coexist only at this temperature. Accordingly, electrons in compounds change their phase from conductive (a liquid phase in which the electrons can flow) to insulating (a solid phase in which the electrons are static), and the conductive and insulating electrons coexist only at a particular temperature called the "phase transition temperature." At other temperatures, either of the phases generally exists. Now, Prof. Okazaki and colleagues have discovered a new phase-change phenomenon that defies common knowledge. 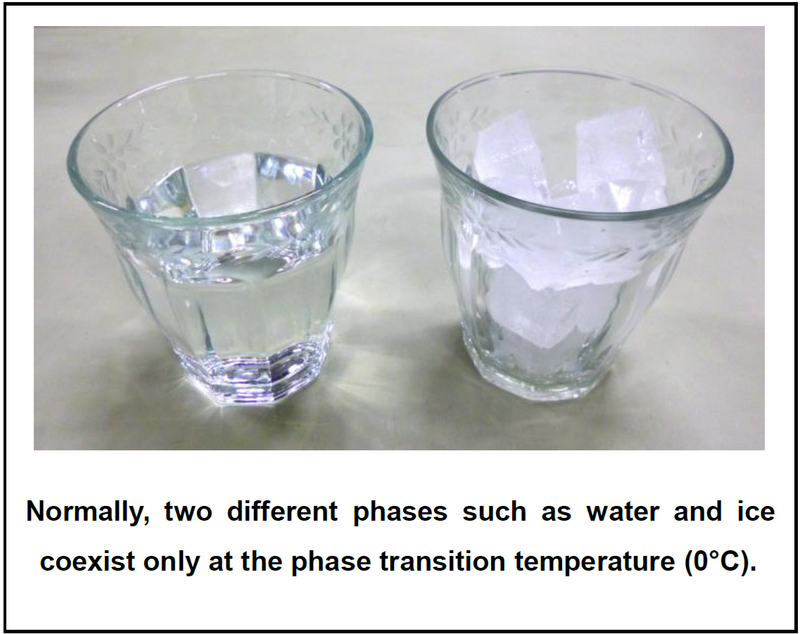 Experimenting at SPring 8, RIKEN--the world's largest synchrotron radiation facility--they confirmed that two different electronic phases coexist over a wide range of temperatures (from ?200 to ?273°C), and these phases spatially compete with each other in an organic compound. This state is very unstable, and a slight external stimulus can turn the two phases into a single one, either conductive or insulating. Since the phase can be changed by applying external stimuli such as electric and magnetic fields, these results could lead to the development of new organic electronic materials exhibiting both conducting and insulating properties. Prof. Okazaki seeks to discover new functional characteristics of electrons in materials, and elucidate the origin of the physical properties. There are countless substances around us. Prof. Okazaki finds condensed matter physics very appealing because it allows him to discover the universal and fundamental rules underlying the physical properties of various substances. He researches every day, anticipating the possibility that he might design a new substance based on the rules he has found, and discover a new functional property in materials that no one has ever thought of. "I aim to understand the reason why such phenomena take place, and how we can control the two electronic phases that complete with each other in a material to make the phenomenon practically useful." "It is important to deepen your understanding of your research theme as well as to refer to different fields of research to get ideas. If you believe you can accomplish something, make steady efforts in a flexible way. You have only one life to live. Do not forget that your time is limited. "